Jamestown (JRMC) – It’s official. Cancer care is coming to Jamestown. With the help of supporters and staff, partners in design and construction, Jamestown Regional Medical Center announced Tuesday that it had set the date for the JRMC Cancer Center opening. JRMC’s Chief Executive Officer, Mike Delfs, says oncology services were a dream of the Boards and the community when JRMC moved from downtown to southwest Jamestown in 2011. Delfs adds, With the help of Davis Group, Hillerud Construction team and BWBR Architects, construction of the 3,200 square-foot space includes two exam rooms and six infusion rooms. Those rooms will serve more than 100 people a month, saving 160,000 miles of travel each year. Patients can expect to schedule appointments this summer. 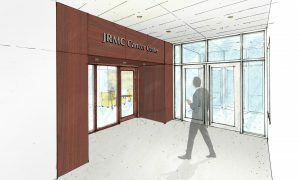 The JRMC Cancer Center Ribbon Cutting Celebration is set for noon, Thursday, June 13 at JRMC. The event is free and open to the public. It includes a light lunch, hope rock painting and self-guided cancer center tours. Cancer has left very few people untouched. In a 60-mile radius, 252 people are diagnosed or pass away from cancer each year. Currently, more than 100 people from the Jamestown region travel 200 miles for a chemotherapy infusion. This may be a monthly, weekly or even daily trip. In Stutsman County, cancer is the leading cause of death for individuals ages 45 – 84.